Privileges. Repository-wide security that controls which task or set of tasks a single user or group of users can access. Permissions. Security assigned to individual folders or global objects in the repository. Create users and assign them to groups. You can create a repository user profile for each person working in the PowerCenter - Repository. Each profile has a separate user name and password. You can also create user groups and assign each user to one or more groups. Then, grant repository privileges to each group so users in the group can perform repository tasks, such as using the Designer or creating workflows. The repository user profile is different from the database user profile. Although a particular user might not have access to a database as a database user, that same person can have privileges to a repository in the database as a repository user. 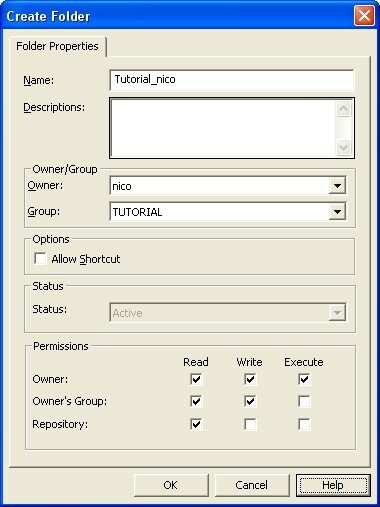 Permissions allow repository users to perform tasks within a folder. With folder permissions, you can control user access to the folder and the tasks you permit them to perform. Folder permissions work closely with repository privileges. Privileges grant access to specific tasks, while permissions grant access to specific folders with read, write, and execute access. However, any user with the Super User privilege can perform all tasks across all folders in the repository. Read permission. You can view the folder and objects in the folder. Write permission. You can create or edit objects in the folder. Execute permission. You can run or schedule workflows in the folder.